What perfect days we’ve been relishing in Cape Town. We’re currently in the middle of an Indian summer….hot, balmy days smack bang in the middle of autumn, and with winter right around the corner, we’re making the most of it. 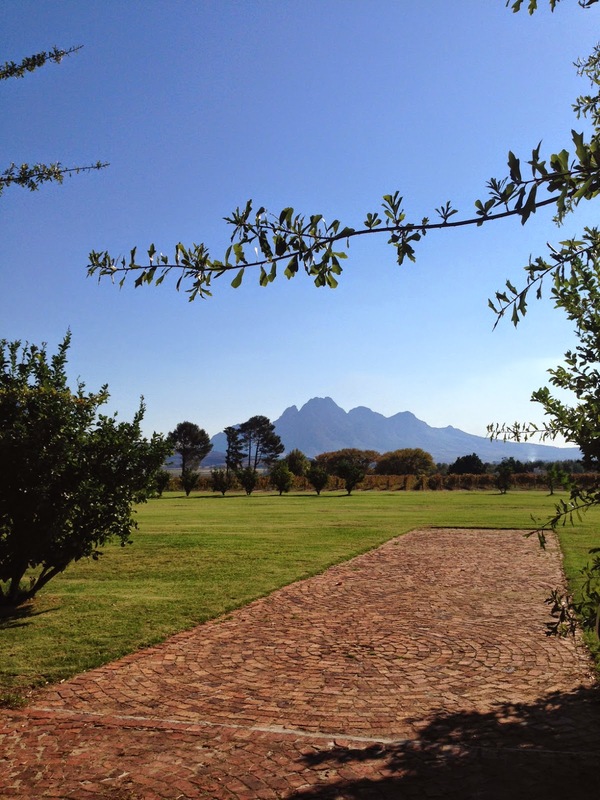 Yesterday I had the pleasure of visiting two fine establishments in Franschhoek (a village that is one of the Cape’s gems just 50 minutes out of the busy city centre) – Le Quartier Francais (LQF) on the main street and Bread and Wine Vineyard Restaurant a short distance away, on the Moreson Estate. My date was Paul van der Spuy of bluecollarwhitecollar fame and wheatgrass hair notoriety. I don’t usually do cocktails over lunch which is clearly ridiculous because it’s a fabulous way to ease into a Saturday. LQF has an inviting selection of what they call ‘food based’ cocktails with unique South African ingredients like mebos, sour figs and buchu, all locally sourced. I opted for the light Francais 75. LQF chef Margot Janse has also created a fabulous bar menu – I loved the tempura beans with a soya and sesame dipping sauce- next time I want to savour the Prawn Popcorn and Wildebeest Popovers! And thanks to Eleanor for the warm welcome and to Elizabeth for the great service. From cocktails to lunch at Bread and Wine Vineyard Restaurant, 5 minutes from LQF, tres convenient. We were warmly greeted by Tina Jewell and well looked after by Cintelle. What a gorgeous setting – the restaurant has a rustic, comfortable feel to it and sitting outside under the trees in 35 degree heat was so cool, literally. The man behind the magic at Bread and Wine is Neil Jewell, aka the ‘Charcuterie Guru’, who opened the doors in 1999 and who believes in unfussy food, ‘fresh, tasty and infused with a passion for life’. Bacon wrapped springbok with butternut, granola and sour figs…melted in the mouth -superb! An excellent Mercator Premium Chardonnay … salu! Looking up…the leaves are turning….